Nancy Pelosi and Chuck Schumer couldn’t contain their glee when the President agreed last week to a short term continuing resolution to reopen the government for three weeks. But this was not a win for the Democrats and no one should interpret it that way. First, only a few agencies were shut down, so the constant hyping of the shutdown by the media was a deliberate effort to magnify the problem to assist their Democrat allies. But since one of the agencies was the Department of Homeland Security, it not only forced the Border Patrol to work without pay, but began creating problems for travelers as TSA personnel began skipping work. Those people who did skip work — about 10 percent of the workforce — did not do that independently. You can be sure they got the green light from their union, the American Federation of Government Employees , which coordinated with congressional Democrats (read Pelosi & Schumer), to ramp up pressure on the president. Of course this is yet another way Democrats demonstrate their utter disregard for the American people. They knew that a disruption in travel plans would make another great optic for their media allies, who had already begun hyping the “soup kitchen” narrative. Meanwhile, realizing the publicity opportunity, or perhaps wanting to stick it to President Trump, or both, DC restaurants began offering free food to those poor government workers! The entire thing was a charade. So President Trump realized this was not politically winnable, as more and more GOP members of Congress grew wobbly. So, in the interest of reducing hardship for government employees working without pay, and the deleterious impact the Schumer/Pelosi/union game was having on the American people, President Trump agreed to a temporary opening to give them a breather. He was forced to do this because Democrat leaders are determined to put their interests ahead of those of the American people, no matter what. This is nothing new. Over 13,000 Americans have been killed by illegal aliens over the past few years, many more were raped and had other unconscionable crimes committed against them, but the bottomless selfishness of congressional Democrats, and the spineless Chamber of Commerce bathroom attendants of the Republican Party, have prevented any efforts to stem the tide of mass migration across our borders by illegal aliens. When a few of the Angel Moms went to Nancy Pelosi’s office to confront her about her failure to support border protection, she hid behind a wall. Ironic, no? Former House Speaker Paul Ryan refused to allow a vote on wall funding. These people are despicable! How many lives would have been saved had they not been slaves to their own interests? President Trump is the only leader in Washington who has shown any leadership. He did so again here. He did not bow to Pelosi and Schumer’s stonewalling. He relented to give those who suffered at the hands of the Democrats a chance to recover. Now he has given the Democrats what they wanted — insisting on negotiations after the government agencies affected by the shutdown were reopened. The ball is now in the Democrats’ court. They can negotiate on the terms they demanded. But they won’t. Nancy and Chuck will continue to stonewall, spending the next three weeks showing their true nature. And as usual, the media will support them, and continues to magnify the false message that Trump “caved.” Just as it did with the Covington kids, Ben Shapiro’s comments about “baby Hitler” at the March for Life, and the Buzzfeed story on Michael Cohen that the Mueller team took the extraordinary step of refuting. CNN just coincidentally happened to be at Roger Stone’s house when the FBI launched a pre-dawn raid with heavily armed SWAT teams typically used against terrorist hideouts and meth labs. For example, twelve police were involved in the drug raid in Houston on Monday, where five police were injured and two criminals killed. Meanwhile, twenty-nine heavily armed agents participated in the raid against Stone and netted them an old man in bathrobe and slippers – a real threat apparently. And to top it off, they forced his wife to stand outside in bare feet and a nightgown. It is illegal for the FBI to coordinate with the media, but it plainly did here, alerting CNN beforehand. The whole shameful episode was conducted for the optics. This is the level of the Mueller team’s ethics. Are they all so tone deaf that they don’t realize how ugly, out of touch, partisan and agenda-driven they look? So after 21 days, the government will shut down again. 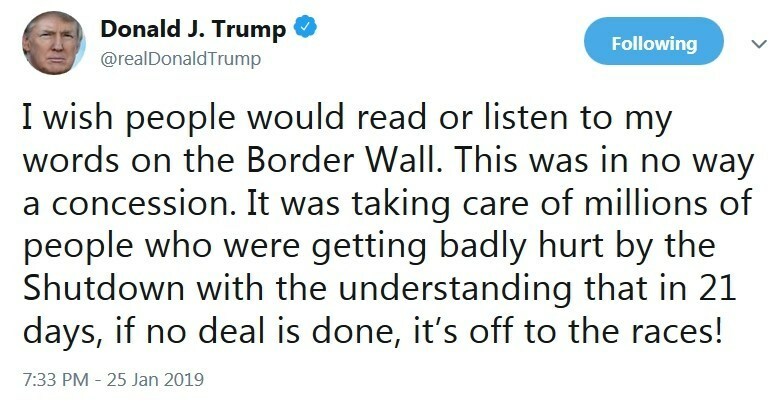 Having given Democrats everything they asked for and still facing resistance, President Trump will have every justification to declare a national emergency and begin building the Wall. Trump’s legal authority to do so is unquestionable. That probably will not stop the unethical Democrats and their allies in the judiciary. Pelosi and Co. are already building a case for a legal challenge by Congress, and a parallel PR campaign to convince American voters that a wall is not in our interest and would “harm communities.” It’s a lot like Pelosi’s infamous “wrap-up smear” video, where she explains how they use the media to smear opponents. But how many communities have been harmed by Congressional inaction? Are 13,000 homicides not enough; 30,000 rapes? If they really don’t understand the position President Trump has put them in, and continue to obstruct through illegal court challenges, it will be obvious to the public that their agenda is entirely self-serving and dangerous — ignoring public safety for their own partisan goals. One final note that might cheer you up. While all this controversy rages, the Wall is actually being built as we speak.